This Industry Ain't Big Enough For Two Tarzans! 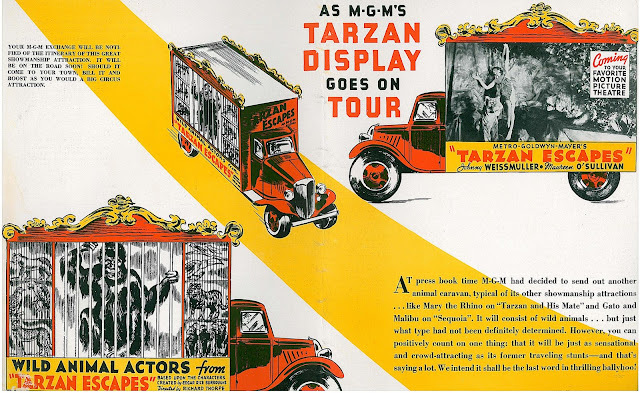 Surely as the mighty Metro lion cleared paths through boxoffice jungles to sell its Tarzan series, so too did scavengers close behind, their penurious State’s Rights merchandise confusing audiences and causing no end to frustration for MGM’s sales force. The studio’s license in the Tarzan character was non-exclusive. Edgar Rice Burroughs had entered into prior commitments for the property, and would continue doing so. The result was interloping serials and features adapted from him, several of which followed in the wake of Metro releases and diminished a public’s confidence in the name brand. 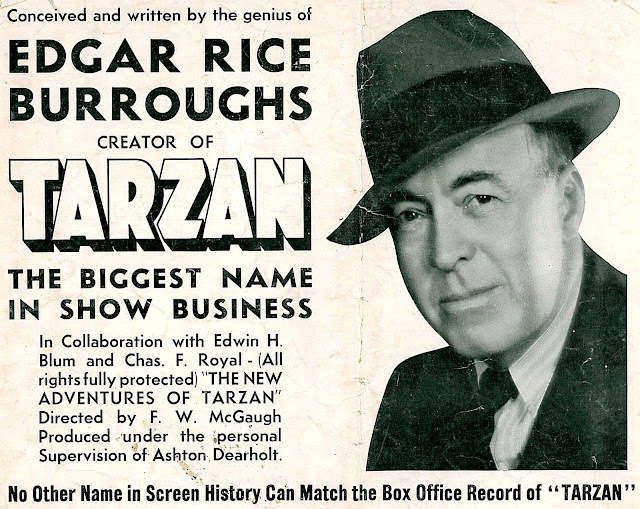 Tarzan, The Ape Man introduced all-talking to Burroughs' jungle in 1932. The author turned Sol Lesser loose on his character the following year. 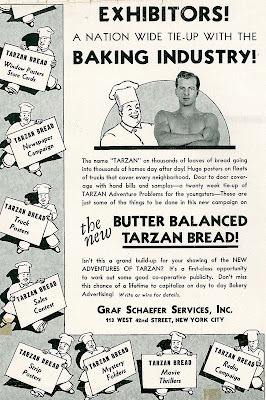 Tarzan The Fearless was a catchpenny independent trading on patron interest generated by Weissmuller’s portrayal. 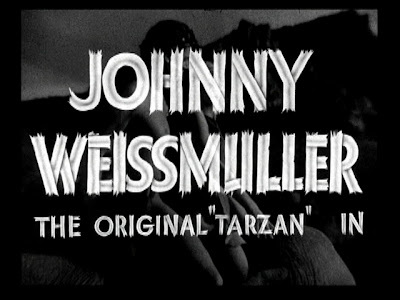 MGM separated themselves from this low-grade venture by identifying Johnny Weissmuller as the Original Tarzan (as shown below in a trailer frame), Hollywood’s most powerful distributor on the defensive and fated to stay there for so long as imitator Tarzans muddied the pond. Metro spent a near-decade trying end-runs against junk dealers loosed by Burroughs. Do Not Confuse It With Any Other Tarzan Production You Have Ever Seen!, said the preview for MGM’s third in their series. By then, Burroughs had himself co-produced a rival product available in a dizzying variety of formats. The New Adventures Of Tarzan would play as a serial --- a part feature/rest serial --- then two features scrounged from the initial two. Plenty there to skim off goodwill generated by Metro’s efforts. This was Spring and Summer of 1935. 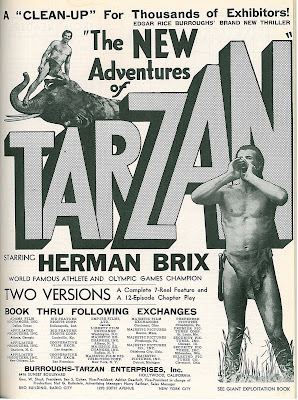 Tarzan and His Mate was finishing its run, and public enthusiasm was at a new pitch. Handy coattails to ride for a haphazard producing partnership barely able to get their serial finished. Five months were spent in a Guatemalan hell-hole dodging payrolls, exploiting natives (at a nickel a day), and embracing every tropical disease known to that benighted region. Herman Brix lived (for one hundred years) to tell about it. They paid him seventy-five dollars a week in exchange for bare feet cut to shreds and fever blighted legs swollen to the size of pumpkins. Jiggs the chimp got two thousand dollars for pitching in on the expedition. Add up the paid hours and he/she/it could no doubt have bought drinks for hapless Brix. The New Adventures Of Tarzan plays like something Carl Denham shot and brought back aboard the Venture. It was sure enough a crazy voyage for that crew of twenty-nine (and I’m betting several are buried down there), with snakes and ticks aplenty. Brix said they ate turtles after food ran out. One of the snappers latches on to the rear of Tarzan's comic relief and leads a merry chase just ahead of the microphone’s capacity to record. Considering the menu as described by Brix, this may be the only instance of a bit player being eaten by cast and crew at the conclusion of a work day (and who’s to say turtles aren’t palatable enough when you’re starving in the jungle?). There’s lots to like in The New Adventures Of Tarzan. Brix’s vine swinging is exemplary. He could as easily leap off the Chrysler Building for feats performed here, handily trumping trapeze artist doubles MGM used. He also outswims that alligator that was supposed to have his mouth wired shut, but didn’t. Gentle Jackie (the lion) wrestles with Brix just as he had (and would) on numerous other occasions between the silent era and 1953. Anytime you see a big tame cat pushed around by Harold Lloyd, Betty Hutton, or some other star name, it’s probably Jackie (he’d again be bested at pension age by Victor Mature in Samson and Delilah). Jiggs the Chimp liked to drop on Brix from twenty feet above and dig his nails into the actor’s scalp. There’s a scene wherein his grunting elicits a startled reaction from Tarzan --- What’s that? Prisoners in the lost city? --- and sure enough, that’s what they find. Everyone is chasing after a cumbersome box said to contain The Green Goddess, lately filched from inhabitants of said lost city. Native extras got a fifteen-cent bonus when they fought Tarzan. I’m not sure they understood that this was only play-acting, as Brix looks pretty desperate amidst these set-to's. He never engages one when a dozen will do. No Ape-Man before Gordon Scott would command such respect for dare deviling amidst location hardship as opposed to a backlot five minutes from the Metro commissary. The New Adventures Of Tarzan achieves moments of real spectacle and grandeur, effects we admire all the more for having come of genuine hazard and privation. Producer Ashton Dearholt assumed the onscreen villain role. He carries the Green Goddess around like Pilgrim’s Progress. Seems the idol’s no good without a code book that goes with it, and the code book is useless without the idol. Why bother with either? Tarzan explains that it holds a formula for the world’s most powerful explosive, endless push/ pulling the result through all of chapters. Pursuers include a flunky who joins the expedition to be near his idol, Tarzan (as described in introductory titles). Modern sensibility might encourage this character’s polite removal to a Group Home environment, as he seems genuinely brain-damaged. Villains at the top are referred to as unscrupulous munition manufacturers, which left me to ponder if indeed there were ever munition manufacturers who weren’t unscrupulous, leastwise in movies. 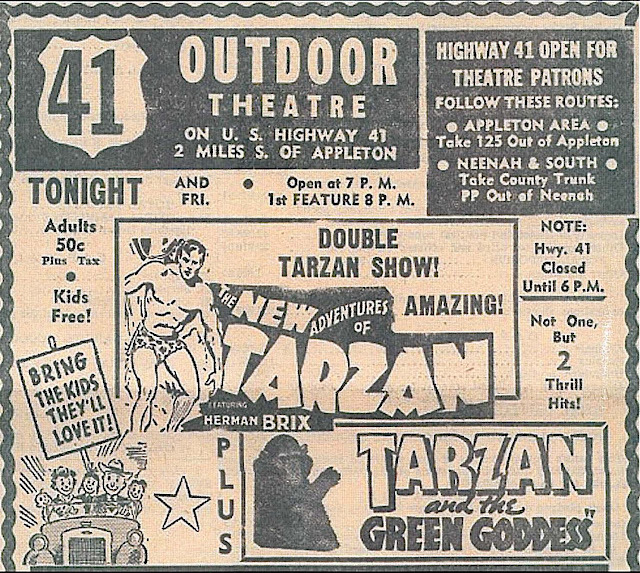 The New Adventures Of Tarzan was mostly seen during later years in truncated feature form. Sometimes they overlapped and highlights from one appeared also in the other. Here’s a drive-in ad pushing both. Patrons must have scratched heads over prospects of watching much the same movie twice under differing titles. The features were included in a television package making syndicated rounds from the sixties on. Thunderbird Films of Los Angeles discovered a 35mm print of the now public domain serial version and sold it to collectors in the seventies. Virtually every video and DVD derives from this. Be prepared to squint and call upon your ear trumpet should you engage these twelve chapters, but be assured too of action extraordinary and sights not to be seen elsewhere. JUST IN! What follows are the reminiscences of longtime collector and historian Kingsley Candler, who was employed by Tom Dunnahoo and Thunderbird Films shortly after they acquired that rare 35mm print of The New Adventures Of Tarzan back in the seventies. I’ll leave it to Kingsley to tell the following story in his own words. Regarding the Tarzan serial, it was already in the catalog when I arrived for duty on the good (pirate) ship Thunderbird. I well recall a list of 35mm holdings left over from an independent film exchange in Tennessee from which I requisitioned many other titles, including Poppin’ The Cork and other Educational shorts, two other serials The Clutching Hand and The Black Coin, a Cinecolor print of Caribou Trail which suffered from dye bleed-thru and was not copied, and the 1930 Sennett 2-color The Bluffer which was in great shape. 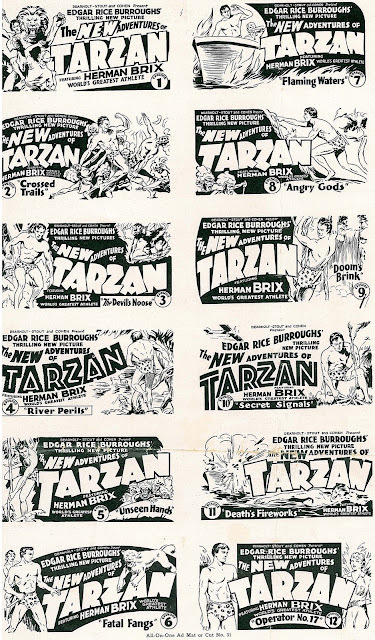 I'm absolutely positive that The New Adventures Of Tarzan was on that list and that this was the 35mm source material (oh, how I wish I had made copies of that list and so many other things, they would have made a great read). I think he had Tarzan and The Green Goddess as well. I don't remember the name of the exchange but I do remember the contact name as I thought it a coincidence: Chuck Jones. The deal was the loan of the 35mm for a 16mm print of the same title, or comparable length if he had no interest in the loaner. He was wonderful to deal with and had hundreds of titles, most of which were unseen and unknown at that time. If something like iMDB.com had been available things may have been very different. I had no idea The Bluffer was color until it arrived, and believe it proved to be the only surviving print. I imagine many of the titles he had are now lost as well - there was only so much $ to create new negatives, and some enticing sounding titles just didn't sell. Tom was really good at recalling all the old B westerns he saw as a kid. When I arrived, another employee was an Encyclopedia-On-Legs and did all the catalog paste-ups as well as supplying a lot of 16mm for copying. There was also a co-worker doing most of the descriptive write-ups. I remember he adamantly refused to watch a short called Fonteyn Dances and for the catalog wrote simply the world-famous ballerina struts her stuff! I was 24 when I started working for Tom and left a very comfortable life in San Diego managing a used record store downtown during the day and doing projection at a 16mm revival house called the Cinema Leo in Pacific Beach at night. Surfing all off-hours, had a 1 bedroom apt a half block from Ocean Beach. Gave it all up (along with a MASSIVE hit to my income) to pursue a career in "Film Preservation" - way before it was cool OR honorable. MGM seethed over independent poaching of jealously guarded franchises, but in this instance, what could they do? Plenty, if we choose to believe anecdotal evidence passed down by exhibitors spanked for negotiating with second string Tarzans. Suppose you’re booking an entire season of Metro product for your house, but elect to play The New Adventures Of Tarzan over twelve Saturdays. The MGM salesman notes your marquee and reports back to his field supervisor. That next visit from The Friendly Company (as Metro liked to characterize itself to exhibs) is less friendly. Maybe you’ll get the forthcoming Tarzan Escapes and maybe you won’t. Perhaps a competing house can use the latest Clark Gable or MacDonald/Eddy special. Anyway, you’d soon be sorry for having bought The New Adventures Of Tarzan. MGM was like any other powerful corporation, with ways all their own of squeezing out competition. I have no doubt this serial would have performed better in a more congenial distributing environment, as it did have success in foreign territories. 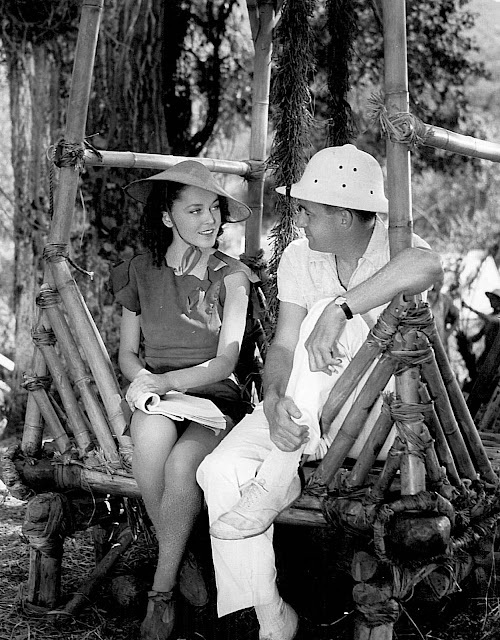 Metro’s own Tarzan Escapes, finally released November 1936, was a quilt whose sections included one feature made, then virtually remade, by directors seated on musical chairs (that’s credited Richard Thorpe sharing a break with Maureen O’Sullivan on the set). Studio arrogance or plain cynicism bred a finished movie with stock footage content approaching that of a post-war Republic serial. Watching Tarzan Escapes on a typical Sunday afternoon TV broadcast alerted viewers to economies practiced by MGM. Hadn't Weismuller aqua-struggled with the same alligator in Tarzan and His Mate? Tune in next week, for he’ll repeat it in Tarzan’s Secret Treasure (and yet again in the 1959 remake of Tarzan, The Ape Man). Tarzan Escapes is a handsome production, and stark contrast to prehistoric New Adventures Of Tarzan, but stampeding elephants during the climax look mighty familiar, having plowed backlot foliage in Tarzan, The Ape Man. Plenty of library set pieces adorn Tarzan Escapes, precious little of action original to this show. A biggest thrill had to be removed. Sufficient traces remain to frustrate us all the more over the loss of what may have been the most exciting and bloodthirsty highlight in all of MGM Tarzans…. The giant vampire bats designed for Tarzan Escapes sound inspired. Metro engineers gave them moving heads, working jaws, and lighted eyes (for more, see Rudy Behlmer’s excellent Tarzan articles for American Cinematographer). Results reduced children at previews to screaming fits. Reaction demanded the sequence be removed, but what spectacle this must have been. The swamp cavern itself was a triumph of unsettling design. This at least, plus oversized lizards, remain on view in Tarzan Escapes, but imagine bats carrying off victims in their bloody jaws. This alone would have elevated Tarzan Escapes to pride of place among the series’ best. The sequence being excised and then discarded may be counted a sad loss alongside junked footage, considered in its day too horrific or intense, from the 1925 Phantom Of The Opera, The Most Dangerous Game, and others. More frustrating still was Metro marketer's failure to adjust their campaign to reflect pre-release cuts. 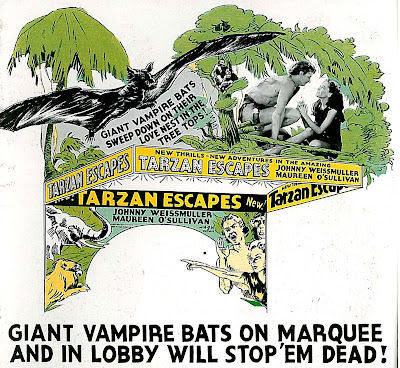 Ads (one shown here) were now misleading in the extreme --- Giant vulture bats swooping from the sky make their ferocious attack … Note also the pressbook suggestion for a lobby display, the bats again called upon to entice patrons. 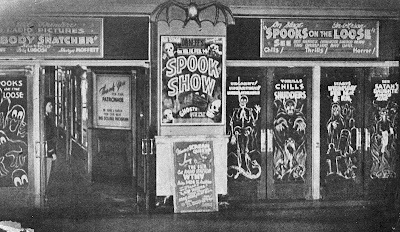 There is no indication that this footage was ever exhibited to the public, outside of previews, so how did showmen answer when customers inquired post-show as to absence of killer bats on screen? Nearly twenty years later, studio blinders were still on. 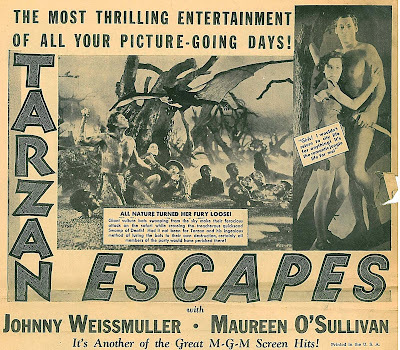 Metro had a successful reissue of Tarzan Escapes in 1954 (with eventual profits of $172,000). Poster art again displayed the bats. 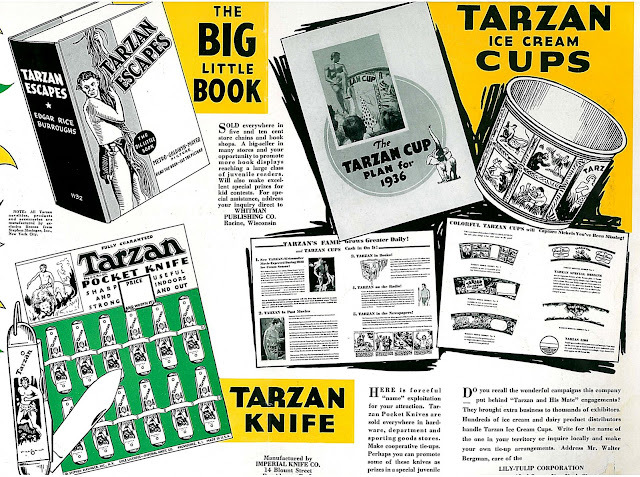 They may not have survived the final cut of Tarzan Escapes, but surely hung on for decades in printed publicity. 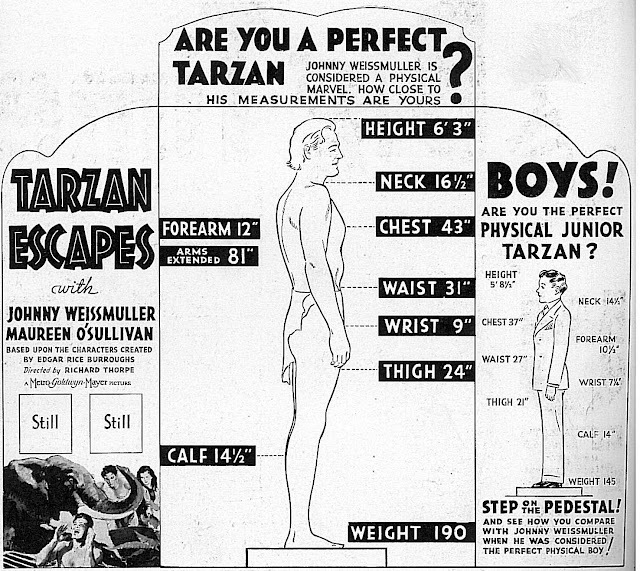 The feature itself couldn’t scale the heights of Tarzan and His Mate (what could? ), but there is plenty yet to enjoy. Tarzan's tree house is a marvel of art department ingenuity, and pacing seldom flags. Tarzan Escapes was budgeted at a modest $335,000, but additional expense generated by re-shooting sent negative costs to a million. 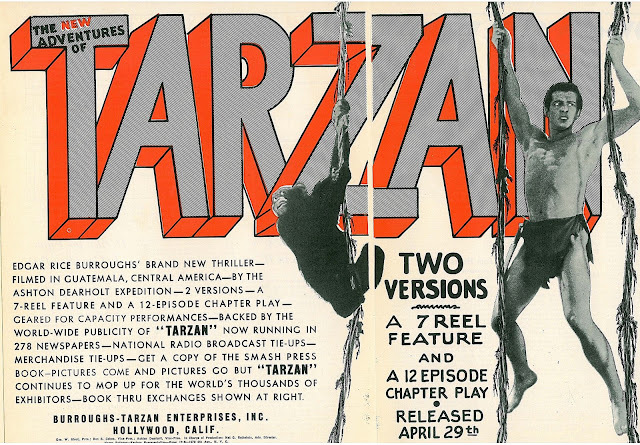 Domestic rentals were $776,000, with foreign its usual high number for a Tarzan --- $1.1 million. 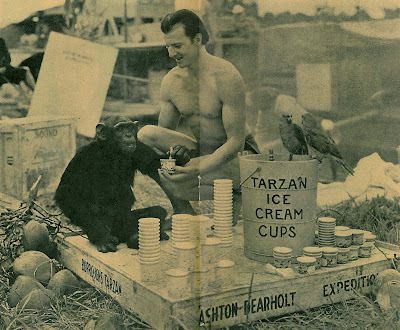 Final profits were $209,000, an improvement upon Tarzan and His Mate ($161,000), but well below gains made by Tarzan Finds A Son three years later. Those profits of $528,000 would increase further with Metro’s final two, Tarzan’s Secret Treasure ($866,000) and Tarzan’s New York Adventure ($985,000). New York Adventure was, in fact, the most lucrative of Metro’s six. This is a series that might have continued at MGM, despite the loss of foreign markets during wartime and resulting lack of studio interest. Sol Lesser and RKO would acquire the series and continue it over years of successful play. There were complications. Manager Harry Crawford had a warrant served on him for disturbing the peace. Seems his ideas for a set piece to adorn the top of the Missouri’s marquee unsettled nearby tenants and otherwise sedate passerbys. Why should a mechanical dog howling at one-second intervals annoy anyone? asked Harry. Gendarmes advised him to tell it to the judge. 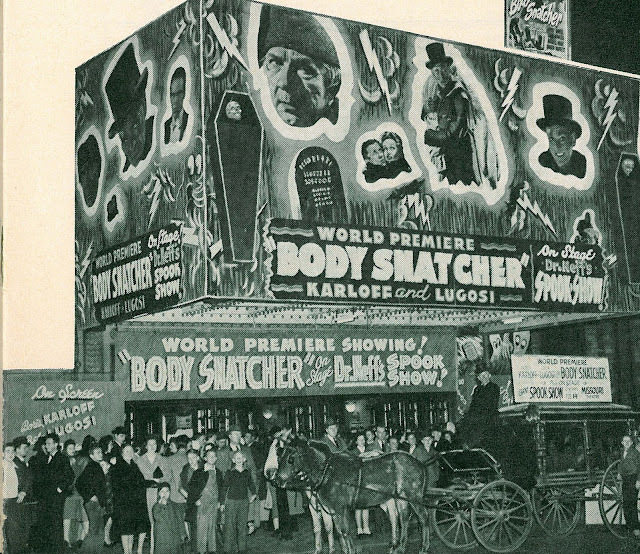 A fifteen-foot square lobby display (shown here) featured a motorized Karloff figure dragging a female corpse out of its tomb, while a "hundred-year-old hearse" carried dummy cadavers thither and yon with the assist of what was described as two decrepit horses. 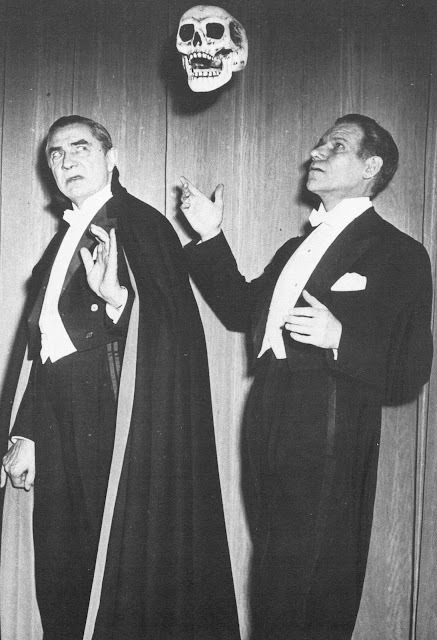 As The Body Snatcher opened on February 14, valentines were dispatched about town, showing Boris strangling Bela with the caption, Please Give Me A Piece Of Your Heart. RKO’s New York office supervised the campaign. There were horrors staged live that Lewton’s denuded by the Code feature couldn’t begin to duplicate. 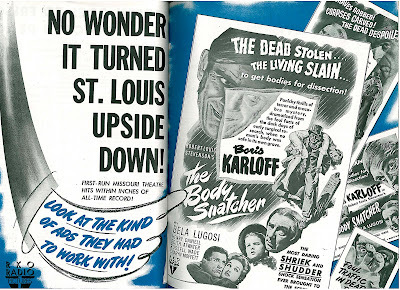 Kids doubtlessly got more genuine scares out of Neff’s pageant and accompanying front displays than The Body Snatcher would deliver, yet here at last was a solid hit that demonstrated what Val Lewton could do when he turned his hand toward baser shocks. Its success would enable others with a morbid line of goods to sell. 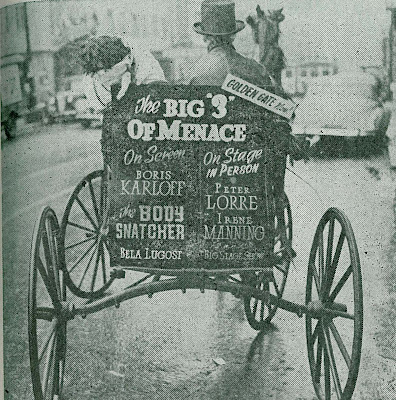 Peter Lorre enhanced Body Snatcher presentations (as advertised on a carriage back here) with a ghoulish monologue he had commissioned to show off vocal talent plied in Hollywood thrillers over the last decade. The Man With A Head Of Glass was recited by the actor in hushed auditoriums, followed by bursts of applause and demands for repeated curtain calls. Lorre had initiated the routine in August, 1944, and continued with it on and off for several years thereafter. His would have been an ideal stage warmer for a horror film. 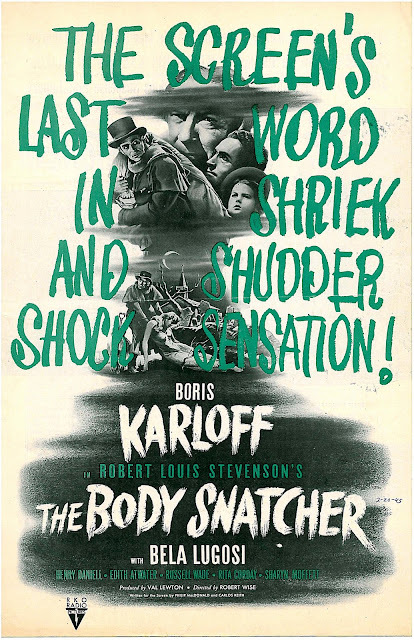 The Body Snatcher’s negative was on the high-end at $221,000, but domestic rentals rang up a satisfying $317,000, with foreign money the best ever for this series --- $230,000. Profits amounted to $118,000, the most since I Walked With A Zombie. 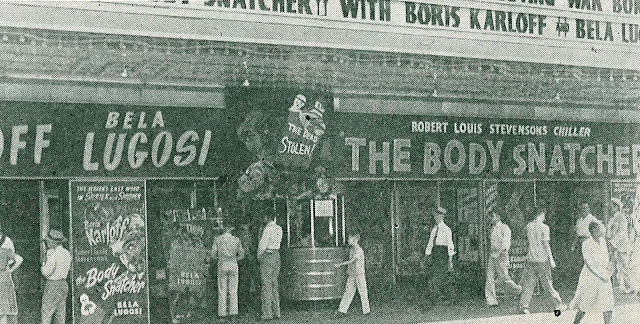 Were it not for a higher cost, The Body Snatcher would have been the most lucrative of all Lewtons. As it is, the film stands as the biggest single grosser of the nine. You’d have thought Universal producer Jack Gross would ride herd over Val Lewton once he assumed supervisory duties at RKO, but the man behind Universal’s recent monster sequels seems to have pretty much left VL alone. 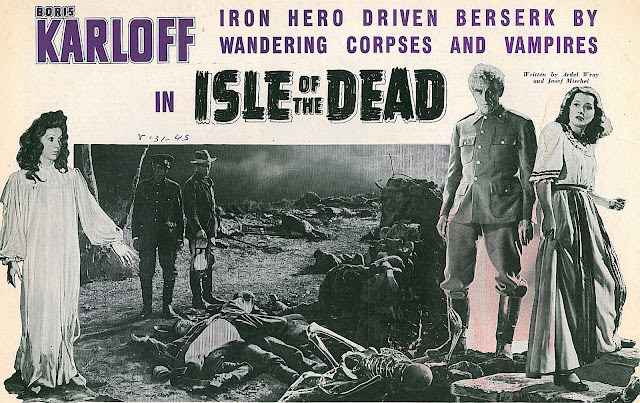 Gross is credited as Executive Producer on Isle Of The Dead. Lewton portrayed him as another of those studio troglodytes with his cigar in one hand and a racing form in the other. Evidence of the last three in the Lewton series belie such an image. They are, in fact, among the artiest of the nine. 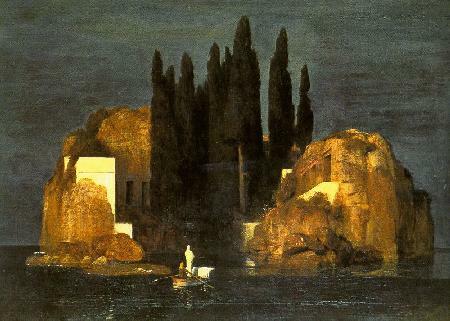 Isle Of The Dead took its inspiration from a painting (of the same name) by one Arnold Bocklin, who set his gothic scene to canvas five different times. 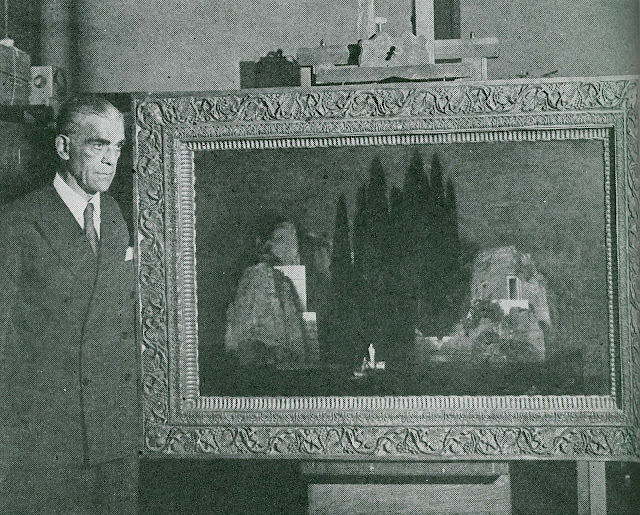 Boris Karloff assumed patron of the arts duty for a field trip to New York’s Metropolitan Museum, where he was photographed standing alongside one of them. It pleased and flattered Karloff to keep company like this. He was a cultivated man and appreciated that quality in others. Whatever misgivings Lewton had about using this actor dissolved once they met. The producer frequently called upon memories of creepy art he’d been exposed to as a child (that generation’s equivalent of our monster magazines, perhaps?) 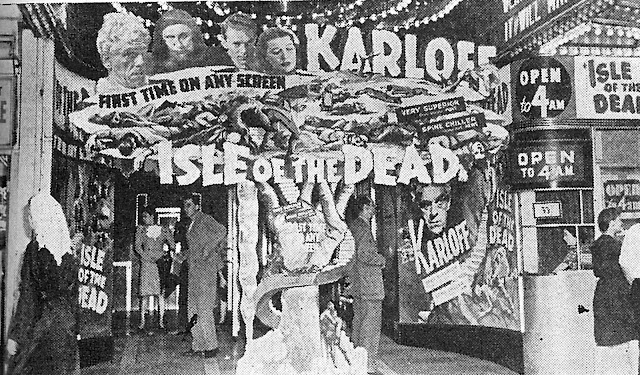 and Isle Of The Dead would emerge as much a tribute to things that went bump in Lewton’s boyhood nights. 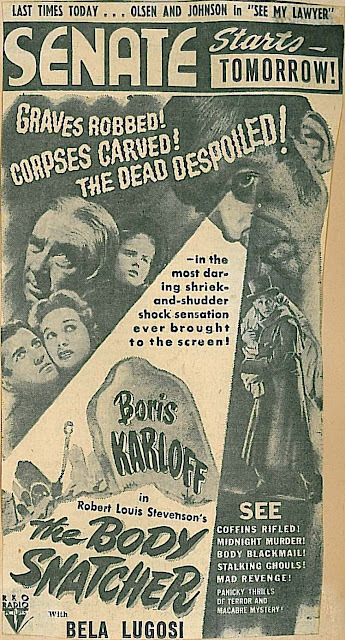 Karloff was the first real star to do a Lewton movie. You could wish he’d been in more than just three, but did RKO really pay him a mere $600 per week as I’ve read? There was a serious delay when BK fell out due to back problems. A spinal operation laid him up for months; time enough for the project to lose momentum and Lewton’s interest to wane. A complete mess, he now called it. Slow perhaps, but wasn’t that the case with most Lewton merchandise? Amazing how all nine have their adherents. I’ve read passionate arguments crediting each as best in the series. Life was simpler when they were new. 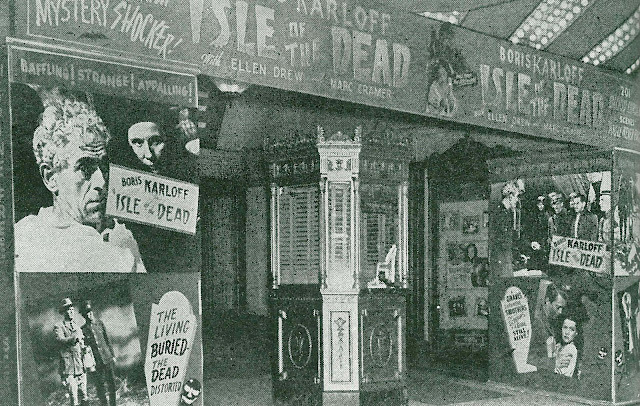 Showmen thought Isle Of The Dead dragged at first, but relished patron screams when a woman gets buried alive in the second half. 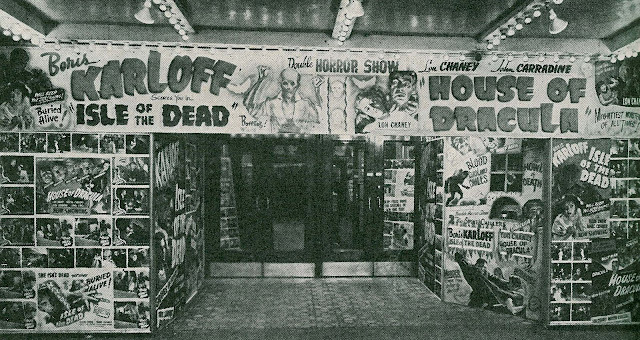 Even that may not have been enough to offset continuing inertia at ticket windows, as Isle Of The Dead was way down from stellar numbers recorded by The Body Snatcher. A $246,000 negative cost was the highest yet for a Lewton horror, and way more than they were spending for other "B" pictures. Domestic rentals amounted to $266,000, with foreign $117,000. RKO’s profit was the lowest so far --- $13,000. These were slim pickings during a year when expectations ran high, as one couldn’t help making money off movies in 1945. Was the public tiring of horror films, or just Lewton’s horror films? 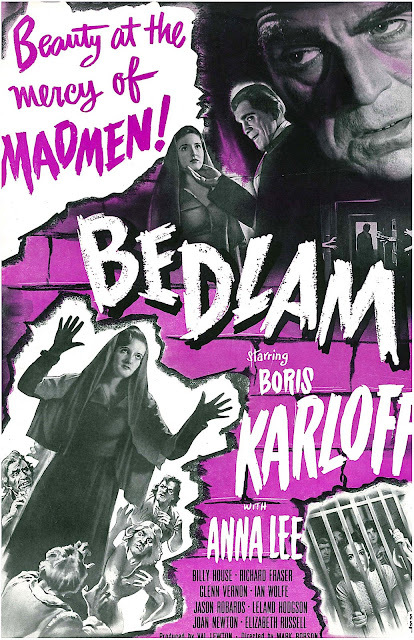 about lunatic asylums sounds fine when Olivia DeHavilland is your inmate, but Boris Karloff presiding could mean only one thing, and therein lay the disconnect. The star didn’t help when he insisted that Bedlam wasn’t a horror film at all. A historical picture, said Karloff. Negative cost reflected steady rises in expense these shows generated. Modern writers claim Lewton had a budget of $350,000 plus extended pre-production time, but RKO ledgers indicate $264,000, a more likely figure. Domestic ($257,000) and foreign ($98,000) rentals were sufficiently eroded as to result in $40,000 lost on Bedlam. It’s no disgrace to any filmmaker when his series winnows out. The fact Lewton managed nine horror features, and nine of such extraordinary quality, within confines of a formula-driven system like RKO’s, is some kind of miracle. His standards remained high, even if the boxoffice didn’t. 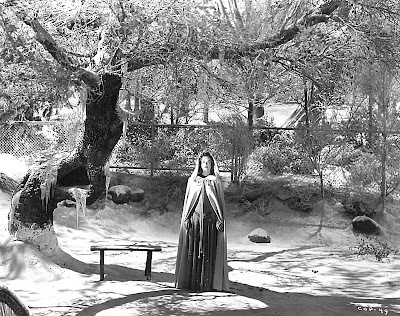 No one else in Hollywood was making chillers so stimulating as Lewton’s. You can pick at any and find minor fault, but who even bothers over most of the stuff Universal was doing after 1942 (Captive Wild Woman, anyone?). Looking at this series during the last several weeks made me realize once again what a unique talent his was. Hammer), along with the Lewtons and other RKO favorites (King Kong, The Thing). This was next best to having Screen Gem’s Shock and Son Of Shock groups. 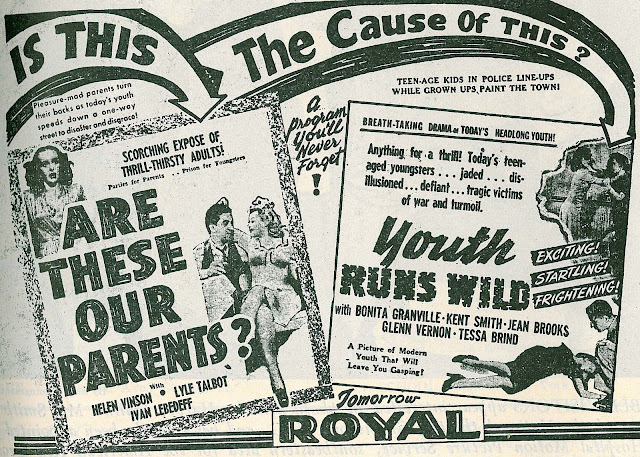 Non-theatrical rental went through Films, Inc. Their daily rates reflected critical hierarchy within the series. 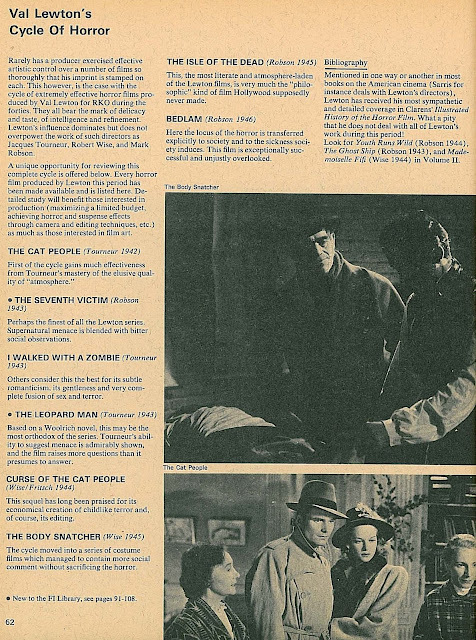 The rental company’s lavish 1971 Rediscovering The American Cinema catalogue devoted a page (shown here) to the Lewtons (note their promise to add The Ghost Ship among future listings). Worth noting is the fact that Bedlam, The Seventh Victim, and The Leopard Man were available at lower rates than the rest. Could these, then, have been regarded weakest by opinion makers of the day? 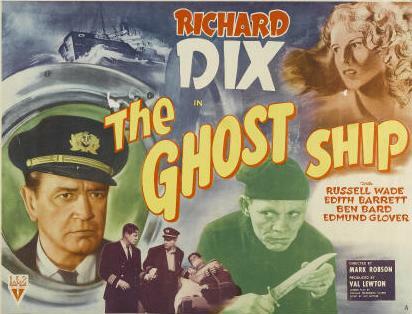 A check of the Films Inc. second edition (1977) of Rediscovering The American Cinema does include The Ghost Ship, which makes me wonder if it was indeed made available then. Did anyone out there actually rent this title in 16mm? The frustrated career of Val Lewton was both inspiration and cautionary fable for Hollywood insiders long before horror fans and writers began taking up his cause in the late sixties. No better evidence exists than 1952’s The Bad and The Beautiful, shooting within a year of Lewton’s death and basing its protagonist’s rise specifically, if not accurately, on Cat People lore and a "B" producer scavenging the lot for props to make his films. 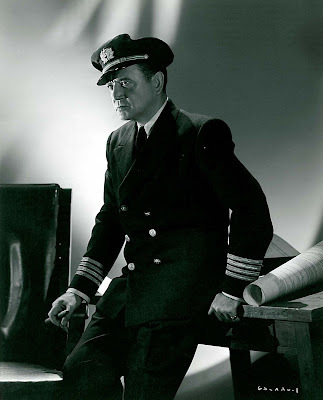 Industry folk must have talked lots about Lewton and why he rose and fell. There were few better object lessons on the peril of seeking art over commerce, nor a more effective argument favoring team play and sucking up to supervisors when necessary. Val Lewton held on to integrity, but little else. He was a talent to admire, but forget about emulating him if you wanted a future in movies. Sad stories like his were best told in eulogies. 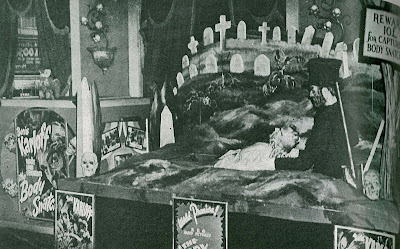 Those nine chillers he made for RKO were a first of Hollywood horrors to be critically embraced, but recognition for Lewton came too late to do him any good (early death at forty-six saw to that). His family at least enjoyed bows he didn’t survive to take. 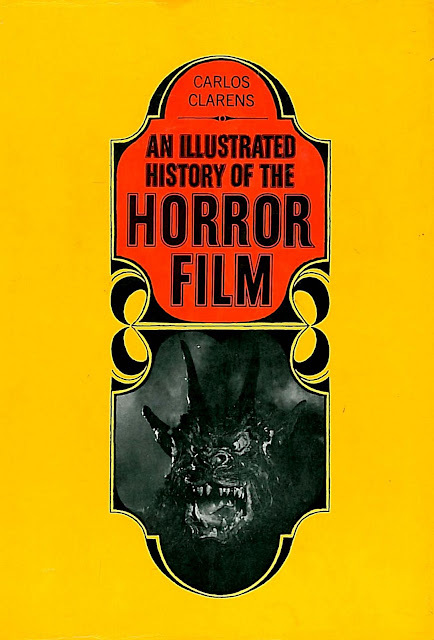 My recollection is of Carlos Clarens getting there first, though An Illustrated History Of The Horror Film was merely the initial Lewton celebration of a second wave starting in 1967. Bigger names recognized him earlier, but did James Agee and Manny Farber’s laudatory reviews during the forties benefit Lewton, or help to bring him down at RKO? I think that few people in Hollywood show in their work that they know or care half as much about movies or human beings as he does, said Agee. He and others praised Lewton as the remarkable exception to philistine standards. Former boss David O. Selznick may have done more harm than good when his post-Cat People congratulatory wire crossed RKO chief Charles Koerner’s desk. (It) is in every way a much better picture than ninety percent of the "A" product that I have seen in recent months. Other studios hopefully have extended such opportunities to would-be producers by the score without getting a result such as you have delivered at the outset. We know corporate intrigues and politics proved Lewton’s undoing. Were jealousies inflamed by these and other plaudits? Koerner was a supporter, but lesser RKO brass sniffed "too arty" when Lewton’s name and accomplishments entered commissary chat. The fact he kept to himself and avoided studio camaraderie was no help (Lewton disliked shaking hands). Lesser talent had but to wait for things to go south. In Lewton’s case, they would not wait long. The golfing party is here for a reason. These are the men who controlled Val Lewton’s fate at RKO. We read about denizens of the front office like Charles Koerner (he having lately expelled Orson Welles) --- that’s him on the right, flanked from the left by N. Peter Rathvon (RKO president), Robert Woolf (New York district manager), and Ned Depinet (RKO Radio Pictures president). 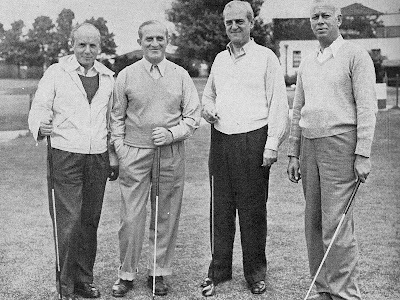 Koerner was vice-president in charge of studio production, and on this 1942 occasion they were competing in the studio’s eighth annual golf tournament. Much studio policy was decided on those links. Perhaps decision to give Welles the heave was made around a third green, and by the fourth, an agreement to hire Lewton. Line-producer underlings weren’t invited to such outings. 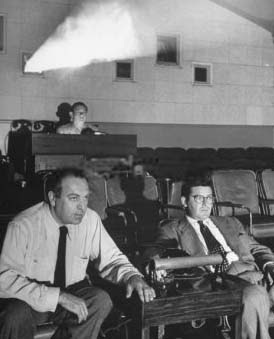 Lewton was assigned to dream up stories for pre-fab titles these men consumer tested at a ceiling price of $150,000 each. 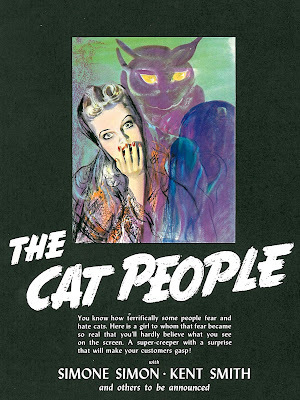 Cat People initiated the series of budget horrors. It became what they called in those days a sleeper. Writer DeWitt Bodeen once estimated a four million dollar gross. Modern historians took him up on that tall tale, and further credited the modest show with saving RKO itself --- their biggest hit of that period (no, those would be Once Upon A Honeymoon, Hitler’s Children, and Mr. Lucky). It is tempting to propagate such myth where we admire the man and his films so much. Cat People did earn $360,000 in domestic rentals. $175,000 came back from foreign. There was $183,000 in profit, an excellent return for a "B" (comparable The Falcon In Danger ended $91,000 in the black, while The Saint Meets The Tiger actually lost $25,000). You could only realize so much on pictures that generally played the bottom of tandem bills. 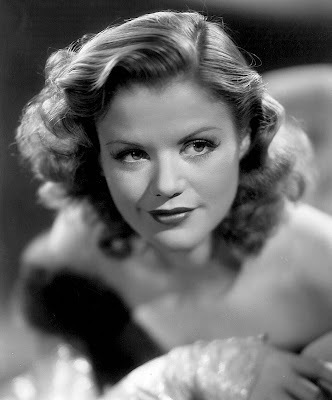 Cat People opened on Broadway as a single, though the Rialto Theatre was not otherwise the sort of venue majors sought for prestige bookings. With a modest 600 seats and no balcony, the Rialto prided itself on ballyhoo techniques otherwise abandoned on the Great White Way. Front displays looked like Grand Guignol. Thriller engagements called for outreach to passer-bys willing to enter and be horrified. Owner and operator Arthur Mayer was a well-respected industry veteran whose career dated back to silents. He thrived on lowdown exploitation. Having supervised Paramount’s Panther Woman search a decade before (for Island Of Lost Souls), he knew how to steer intense bally. Mayer balked at the expense of print ads in The New York Times. 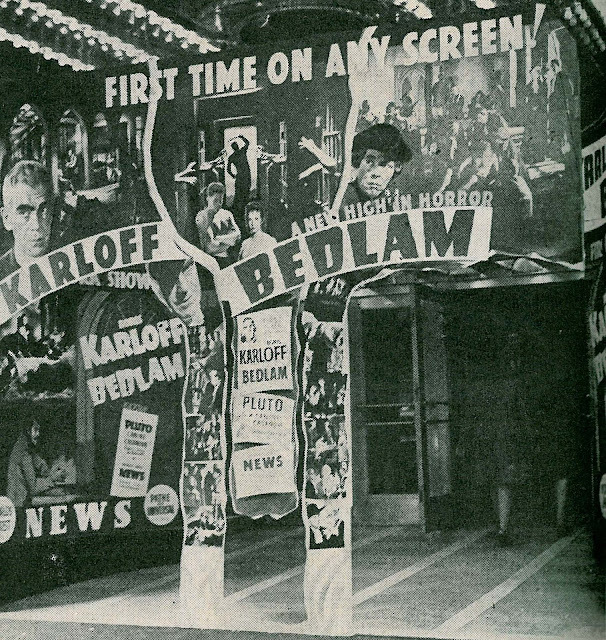 With my limited budget, I had little money to spend on newspaper advertising, so I was forced to use the theatre front and the lobby for my major shilling. Replacing marble busts and objects of art with gargoyles and displays of torture instruments, Mayer proudly trumpeted the Rialto’s strictly masculine fare policy, reflecting his wish to satisfy the ancient and unquenchable male thirst for mystery, menace and manslaughter. Cat People's entrance shown here was the handiwork of his creative staff. Critics enjoyed slumming at the Rialto. The theatre became a running joke in their columns. Like a flower of evil, the Rialto Theatre has endeared itself to a little coterie of necrophiles that haunt the area as a perfect rendezvous for Witches’ Sabbath and Walpurgis Eve celebrations. Admissions were the cheapest around for first runs. 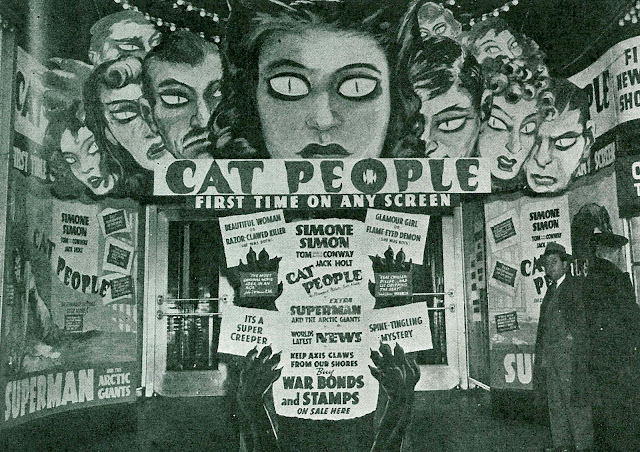 Cat People played in December of 1942 for a quarter before noon, forty cents to 5:00, and sixty-five cents to closing. Sometimes they didn’t clear the house till four in the morning. You could smoke in either of two side sections in the auditorium. Pretty punk for a Broadway engagement, but RKO could boast of having opened there when selling Cat People to independent exhibitors. 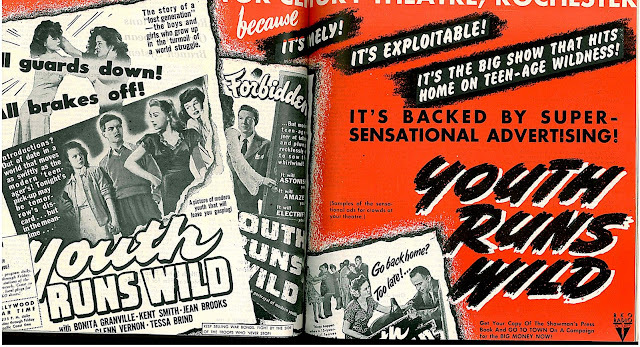 Larger audiences for Val Lewton’s understated chiller found it bringing up the rear behind big ticket crowd-pleasers like Springtime In The Rockies, with which Cat People played in multiple New York City theatres starting January 7. 1943. 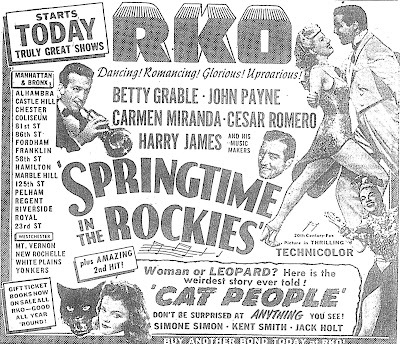 Though Betty Grable’s musical is barely remembered today, this was the kind of show that actually got those four million dollar grosses (in fact, Springtime In The Rockies took $4.4 million in worldwide rentals). 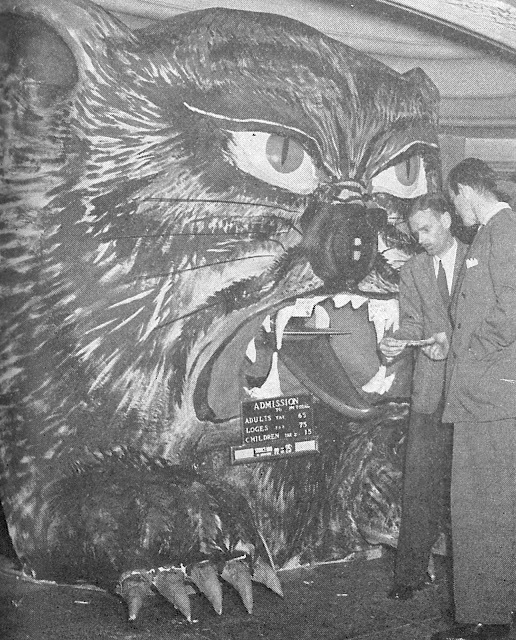 Hollywood's host for Cat People was the Hawaii Theatre, whose boxoffice (as shown) was redressed with a sign reading Feed The Kitty Here. The ticket seller sat inside an enormous cat head that covered the window, sliding both ducats and change along a feline "tongue" draping toward the sidewalk. 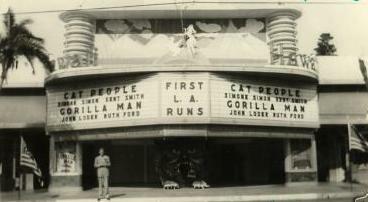 Cat People shared its first LA run with Warner’s The Gorilla Man, as shown in the above snapshot taken in late 1942. Despite critic applause, Val Lewton got little in the way of recognition from bosses at RKO. 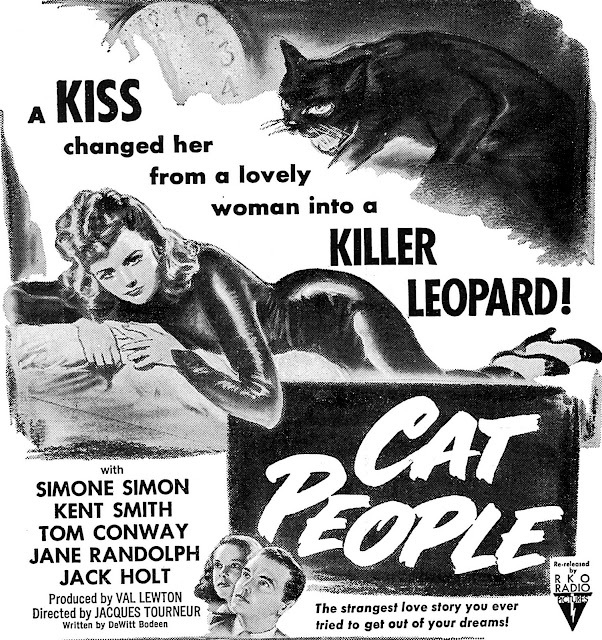 Koerner tossed a wet blanket when Lewton reminded him of Cat People’s success. The only people who saw that film were negroes and defense workers, he said. All RKO wanted from the horror unit was horror movies, preferably conventional ones. 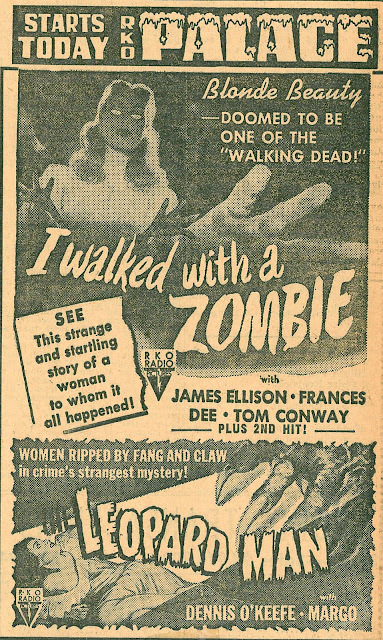 Fortunately for Lewton, I Walked With A Zombie, his second for RKO, maintained Cat People profits and extended his creative autonomy. In the picture, the nurse walked with a zombie. The patrons walked out of the theatre, and the exhibitor walked around in circles trying to think what to do to make up for the loss. This was O.E. Simon’s trenchant commentary that followed his Menno, South Dakota booking of Val Lewton’s follow-up to Cat People. Was the producer determined to work against horror expectations as his series went on? I Walked With A Zombie and The Leopard Man suggested he was. People said they didn't understand this so-called horror picture (The Leopard Man). Business was light (Dewey, Oklahoma’s Paramount Theatre). 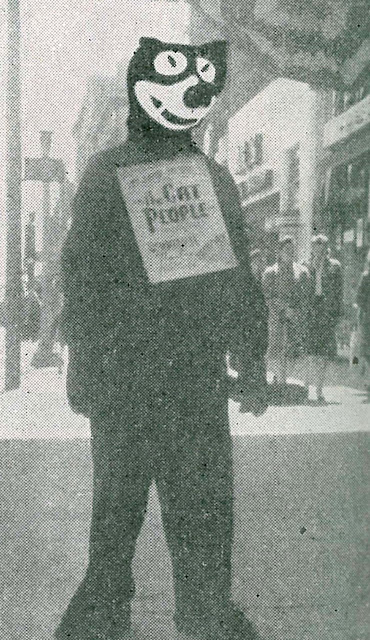 Zombie’s negative cost crept $6,000 beyond the $150,000 limit RKO had set, and its worldwide rentals of $496,000 slipped below those of Cat People, though profits of $181,000 insulated Lewton for the present. He was now getting press recognition as a Merchant Of Menace, Sultan Of Shock, whatever lamebrain tag they chose to hang on him. Profilers wondered what made those chillers tick. Lewton dismissed the recipe as pure formula. The last thing this producer needed was a perception he took horror movies seriously. Ingredients required were plenty of "dark patches" and three bumps per show --- easy as plugging in a waffle iron so it would seem, though Lewton's creative team knew well the efforts he had made to distinguish his thrillers from the rest. Always the last RKO employee to head home at night, Lewton took responsibility for every script page going before a camera. As with mentor Selznick, all set-ups bore the Lewton signature. Despite disappointment his films sometimes yield on first viewing, hanged if they don’t mesmerize with second or more visits. 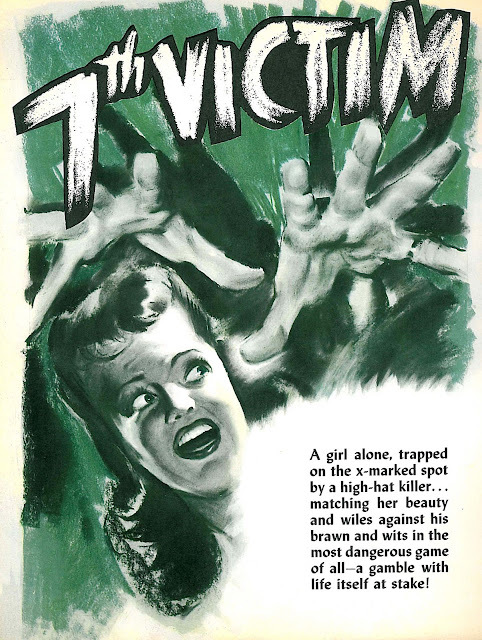 The problem in 1943 was showmen expecting horror to be brightly-lit mummies or wolfmen chasing girls up a tree. 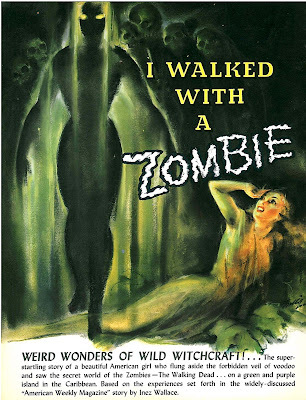 I Walked With A Zombie, despite promise of its title, was Jane Eyre set in the tropics. 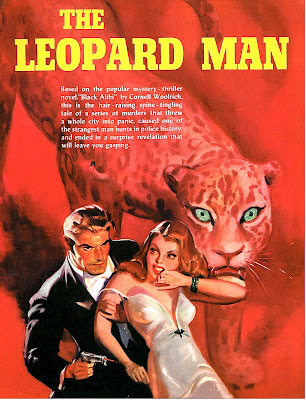 The Leopard Man was no such thing, being devoid of man-into-leopard technics, and in fact, the apparent cat murders were a red herring for human villainy. Lewton kept snatching rugs from under chill fans, and numbers began to reflect their awareness. The Leopard Man cost $155,000. Domestic rentals were $303,000, with foreign $100,000. Final profits of $104,000 represented a steep fall from the first two entries. Lewton were now running even with, if not behind, the Falcon series. A serious, if inevitable, drop-off would begin with The Seventh Victim. Soon it would become a challenge keeping up with Tim Holt.